I can't believe I let it get so bad. I use borax because it doesn't have a strong smell and it's a natural product (which doesn't mean it's safe to eat, you definitely should keep it locked up like all cleaning supplies, and I use gloves while cleaning with it). First off you'll need some borax. I usually find this over near the laundry section of the grocery store, if it's not there try the cleaning section! 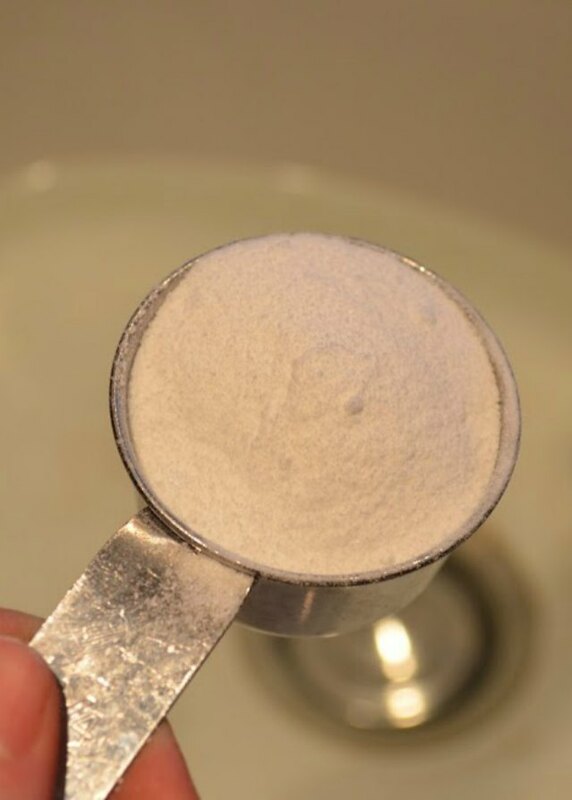 Fill the sink with hot water and add 1/4 cup borax. 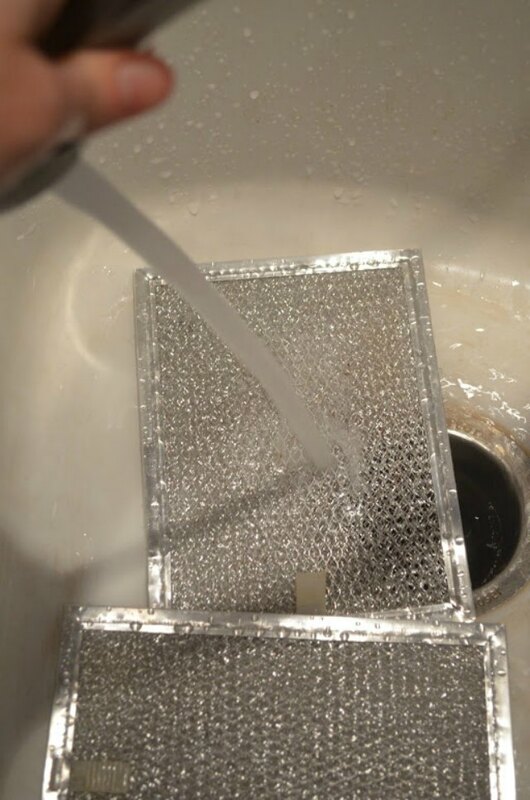 Place the greasy hood vent filters in the water and allow to sit for 15 minutes. I think I just threw up a little looking at this...Gross.. At the end of 15 minutes use a gloved hand and swish filters around in water to loosen up any stubborn grease. 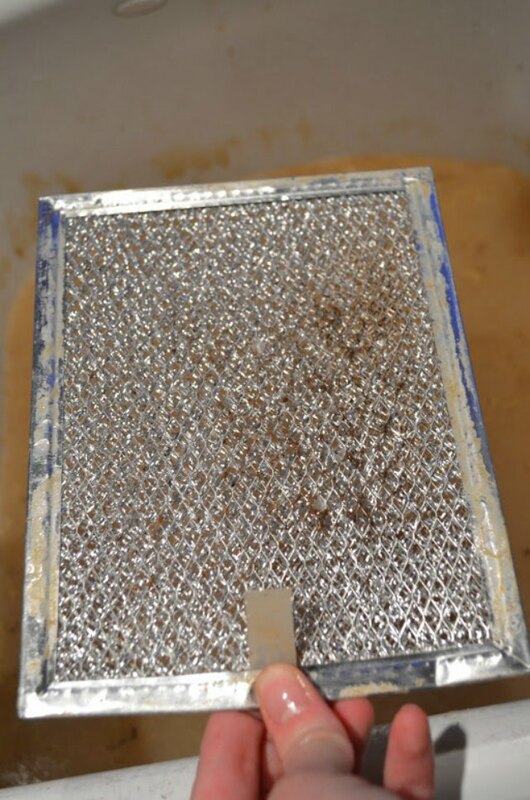 Use a paper towel or old rag and wipe any leftover grease off the edges of the filter. Rinse well under hot water. Clean borax water can be used to wipe down the underside of the hood vent to remove stubborn grease. Please make sure to wear gloves since it can be irritating. by Serena Bakes Simply From Scratch January 13, 2013 This article has been pinned 89000 times and contains 45 user comments. I am putting this on my to-do list this week! I know my filter is pretty bad. Another VERY easy way to do this is to fill a small dishpan with very hot water, 1/2 cup of Calgon Water Softener (liquid or powder) and a few drops of blue Dawn. Calgon is a SUPERB grease remover. 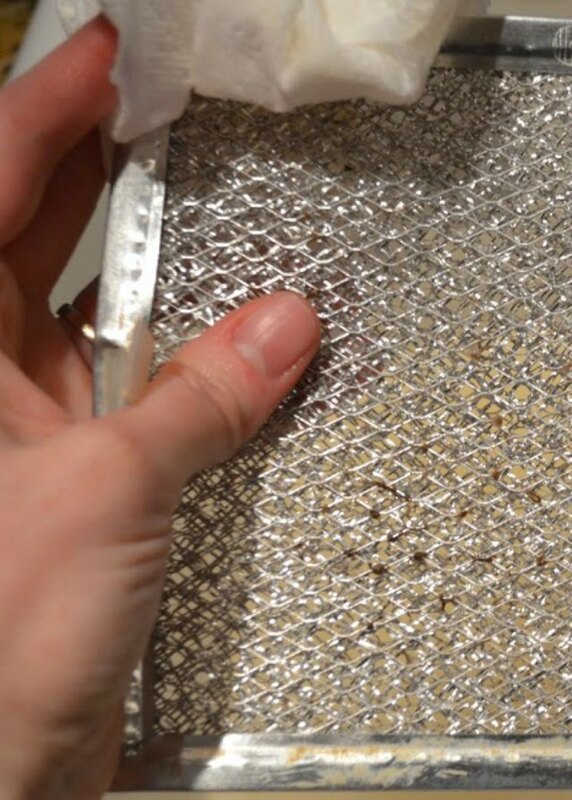 Let your filters sit for 20 minutes and then wipe and rinse - no more grease. This same mixture is great for cleaning greasy cabinet doors and stove hoods. Just don't make the water quite so hot - you don't want to burn your hands. It's wonderful for getting off all that grease and dust that tends to build up near the top of cabinet doors. And you don't need gloves because it's all gentle on your hands! OMGoodness! This is fab. Hello sweetness! Thank you thank you thank you! I tried degreasing my vents with no luck. Can't wait to clean them now! Have a fabulous weekend, cutie! Lol thanks for the tutorial! I currently don't have a hood vent but hopefully if we ever get a house will :P I'd never even thought of needing to clean it. Um, hello? Just throw the effing thing in the dishwasher. Believe it or not, some people do not have dishwashers. Grease and water don't mix. If you put it in the dishwasher there is a decent chance you'll end up with all of the dishes being coated in grease along with the interior of the dishwasher, trust me... 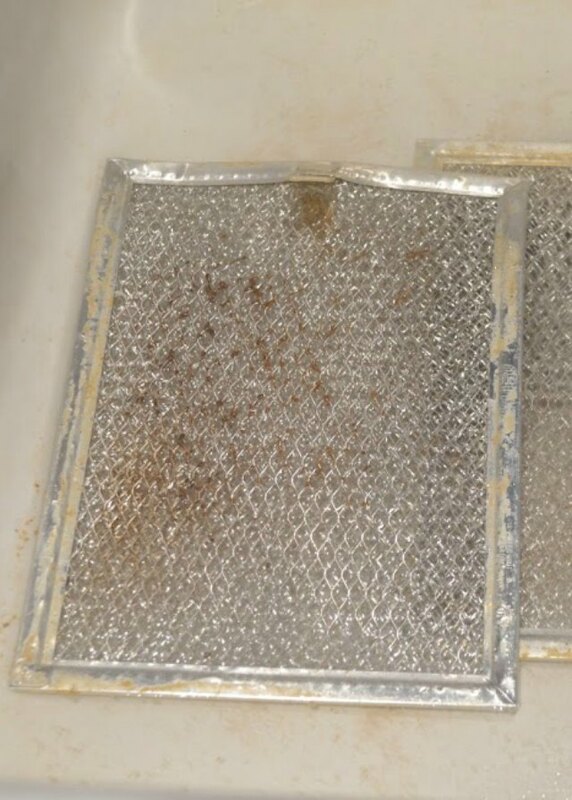 This is a much better way to do it, granted the dishwasher works if you don't have a lot of grease on your filter, but for a filter like this soak it. Mr Clean works wonders with little effort on cleaning the bad greasy stuff. Spray on, soak in hot water gently scrub with a brush, if necessary, rinse and dry, your done! All shiney looking new again. Easiest cleaner I have ever used. Great cleaner on all your sinks, and never scratches or takes of the glossy finish. Get rid of the comet. Keeps them looking shiny new. U will always keep this guy around.. Ya... 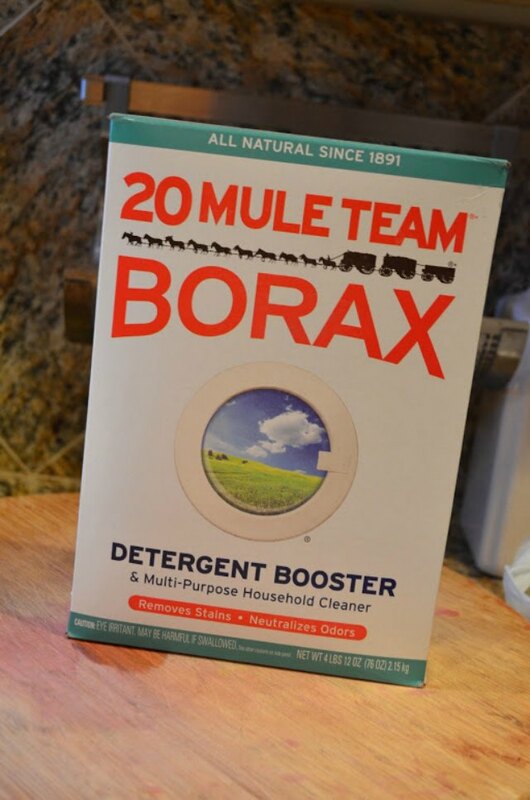 I'm one of those who don't item a dishwasher... Thx for this borax idea I'll have to try it. Last time I cleaned it I used oven cleaner. HATE the smell of any spray oven cleaner.... Closes up my throat and I cough. But u used the hand sprayer on the sink to rinse it with super hot water. Not as clean as this and the smell wasn't worth trying again!! Thx. i haven't tried this yet. I did try to clean it with oven cleaner but it is still grungy....i hate it with a passion. I will try this right away! i hate my grease filter with a passion. after trying to clean it with oven cleaner, it is still grungy and sticky. just awful... so i will try this. it sounds doable and the comments are positive. thanks for the advice!! Thanks Carol! I hope it works as well for you as it does for me! I've went through a lot of cleaners as well that just didn't cut it! I always try not to put grease down the drains. I personally would do this in a tub of some sort and dispose of the greasy water in another way. 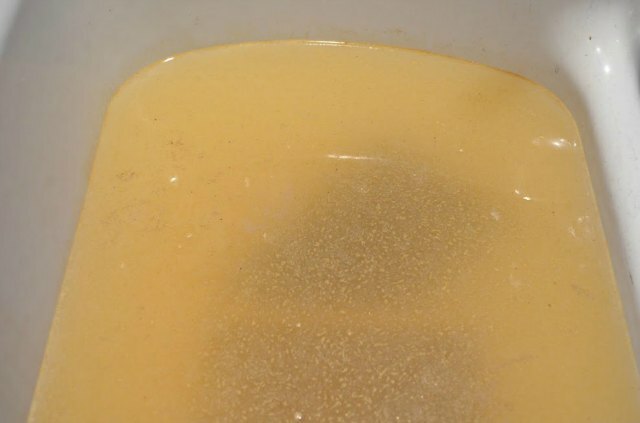 I believe it is recommended that if you are going to put grease down the drain, you should do so with a cleaner- so just like this blogger. That is different than just pouring out your bacon grease without anything to break it up, which can coat the inside of your pipes. Also something to think about if you have a septic. If I ever pour grease down the drain "a no no I know but sometimes after a fish fry I am lazy" I'll pour hot water down the drain for a couple of minutes, that way the grease won't be poured down a could drain "drains are cold being underground" and I figure that gives a nice lining, I also ususlaly put some dawn down the drain right before hand and right afterwards and have been doing this for years with no ill effect. 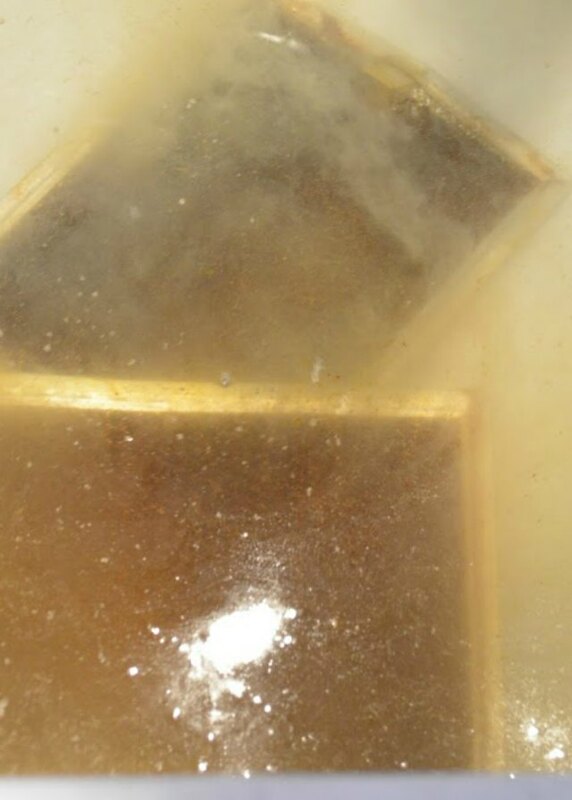 If you pour grease that isn't hot down a really cold drain its going to block it eventually. Just did this, worked exactly as picture shows!! Amazing. This sounds really great, but i don't think i am gonna kill all the good bacteria in my sceptic tank for a stove filter besides i also save bacon grease for my cornbread. But i don't want to pay 250.00 to have my sceptic tank pumped out sorry. I'm going to clean mine this week so it will be nice and clean for the holidays but I am going to use a bucket and dispose of the greasy water outside so that I don't clog the sink drain, thanks for sharing the idea with us. I cannot stress how important cleaning your vent hood filter is. After putting a frying pan on, the grease was hot enough (and the hood filter loaded with grease) that it caught on fire. This caused thousands of dollars in smoke damage and ruined all the knobs on my stove, took out the computer panel, etc. All because of a dirty vent filter and too hot pan! Best hack ever!!! It works brilliantly. Thanks a million. I've been stalling forever to clean the filters. Now its done. And no tears. In the process of remodeling kitchen. All but had my stove hood filter in the trash when I found this post. (And yeah.....even though I'm a clean freak....AND....LOL.....have a Home and Small Office Cleaning Business to boot-which this kind of stuff usually isn't part of the cleaning requirements, but it's still nice to have those little "magical tricks"
that make your clients think you're a GENIOUS when need be!!!! )THANK YOU, THANK YOU, THANK YOU!!!! Can't wait to try this. Absolutely love being able to save money on stuff I already have instead of PAYING for new stuff!!!!! I would not even keep borax in my house with children. Just 1 tablespoon can kill a small child if they eat it! I got rid of all of mine. Be careful! Squirting a little Dawn on the filters helps with the grease build up too. I normally put my in the sink, squirt with a little Dawn, sprinkle with dishwasher detergent and then pour boiling water over them. Let set for awhile and then rinse with hot water. Works like a charm. Can't stress enough most filters can't stand dishwashers, but if you put them on the top shelf and DON'T add dishwashing powder they come up sparkling! Right after I hang the dishwasher cleaning thingy in and put it through a hot wash! I also bought cleaning spray from the company that makes them to do the inside, but my friend recommended using vegetable oil on the cloth first and believe it or not, works better than the cleaner! Just bought the borax and did this. Worked great. And I didn't even have to put out any elbow grease. I am about to try this. I hope it works. Just a fyi you spelled definitely, defiantly. Easy mistake. At the top. Baking soda sprinkled over the top and then pour boiling water over it works too. I've used that when I've run out of borax. This did not work at all. Tried 3 times. Not even a little bit!!! Oh my god, I just did this and I couldn't believe that it took all that gross grease right out of the filter. I kept going back to the sink to look to see if anything was happening. I rinsed in hot water and put it right back up. It was incredible. Almost as good as the dryer sheets for the oven racks. Thank you so much. I will share this with everyone. What is the dryer sheets for oven racks? 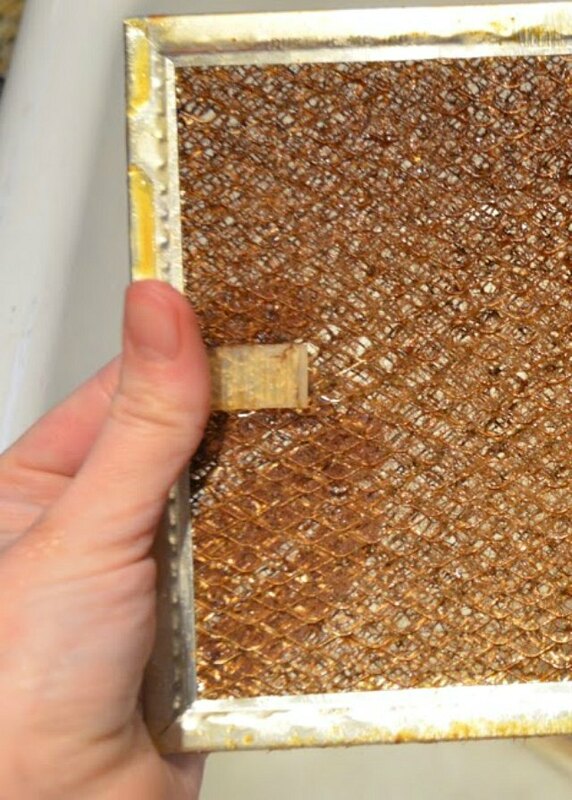 After you have cleaned your filter (mine is in the down draft of my Jenn Air oven) I spray it with a non-stick cooking spray on both sides and the next cleaning is easy with some liquid soap and a dish washing brush right under my kitchen faucet. Takes no time. I just did this little nasty project a couple of days ago. I had limited cleaners available to me. I chose to use a splash of pine sol, and a little dawn and let it sit in very hot water overnight. It definitely softened up the grease however, did not completely remove it. I then squirted just a little bit of liquid dishwasher detergent over them in fresh hot water and minutes later, like brand new! All grease removed. I could not believe it but will definitely remember this in the future! Not one speck of grease left and they were heavily polluted with grease!!! I use TSP, put water in the sink add some tsp , grease just runs out, rinse and done, looks like new. I was browsing Pinterest for cleaning tips and found your tutorial. I can't believe I didn't even know this was something that needed to be done. I'm tall so the hood vent filters (there are two in my hood) are not in my line of sight. I followed your steps using Borax and I feel so accomplished! It's funny how something so simple makes me feel like the kitchen is a lot cleaner. Who knew?! Thanks for the post. I soaked them in the sink for about 15 minutes in hot water and 1/2 cup cascade for dishwashers. It worked very well the 1st time with no scrubbing needed. I can't believe how great this w worked on my tefal deep fryer basket and cover. Thank you for this!!!!! Mine are always so disgusting and I can’t wait to try this! I have used borax since I moved on my own 30+ years ago. Raised 4 children with cotton diapers washed in Borax. My children NEVER tried to eat it. Borax, like ANY OTHER cleaner/soap, should be used with care. I used Borax when out town was attacked w/fleas. Everyone had them, even if you didn't have animale. Borax is a great cleaner!